Source: Mr. Food Test Kitchen Guilt-Free Comfort Favorites. Recipe Credit: Mr. Food Test Kitchen. Photo Credit: Victoria Krog and Kelly Rusin. 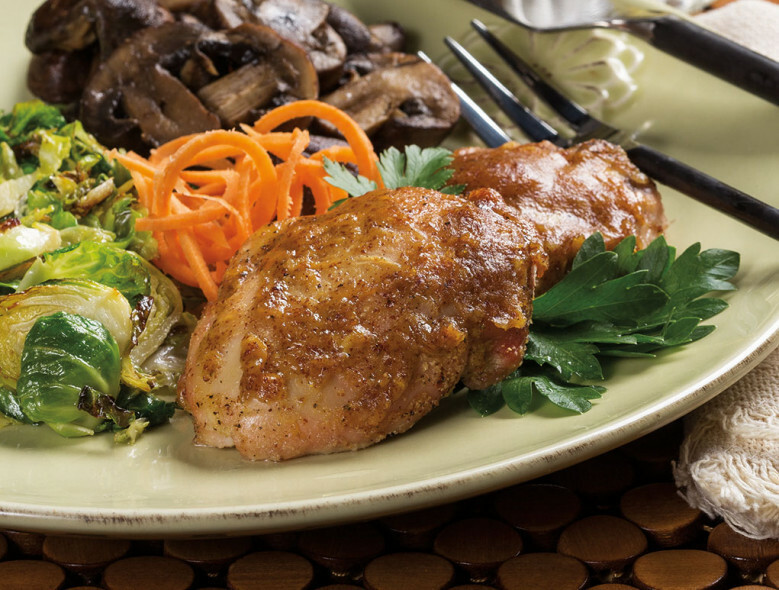 This bold and flavorful chicken goes great with a side of veggies or a small green salad. Dinner is going to be delicious! Preheat the oven to 375° F. Coat a 9-by-13-inch baking dish with cooking spray. In a small bowl, combine the mustard, syrup, and garlic. Mix well; set aside. Evenly sprinkle both sides of the chicken with the salt substitute and pepper. Dip the chicken lightly into the mustard mixture and place in the baking dish. Spoon the remaining mustard mixture on top of each chicken thigh. Bake for 35 to 40 minutes, or until the juices run clear and no pink remains in the center of the chicken. Serve hot.